Mia Thermopolis is a teenage girl who lives with his mother, Helen, in Manhattan-New York. Until a teenager, She lived as an ordinary person but one day she know about her status : SHE IS A PRINCESS ACTUALLY. Mia is a princess from Genovia, small country in Europe. Mia must choose between living in Manhattan or a princess in Genovia. 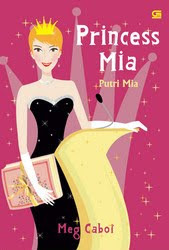 As long as she decide it, Mia lesson a manners to be a good and lovable princess. During that time also became closer to her grandmother. Mia falling love with Michael who is Mia friend's brother. In the end of trilogy, we know Mia finally have a special relationship with Michael. But, do you think they will life happily ever after? BIG NOOOO!!! Meg Cabot, The Princess Diaries's author write about the next episode. Mia and Michael break up on novel 'Princess Mia'. That story teach us how can love ended altough we didn't want it. And how can a perfect couple Mia - Michael basic on The Princess Diaries reader can break up. Perfect couple can be an unperfect mean to be. maaf jika selama saya kenal sama kamu di dunia maya saya selalu membuat kesalaha. tapi orang hidup harus punya prinsip"
gak begitu tau bahasa inggris. I haven't read this book yet. Padahal sebelumnya sempet koleksi. senam pagi di blog biar sehat... satu ..dua..satu..dua...kiri..kanan..kiri..kanan..
waw.. it is the interesting book. from the synopsis, i wanna read it as soon as possible..
i have read it before as well.. its a good and fenomenal story, though.. remember the movie, right? this diary amazing! good luck! Aaaaaah, i love this series!!!!! Yeah, saya juga kenal sama buku harian sang putri ini waktu sma, dipinjemin oleh sahabat saya, dan langsung jatuh hati seketika *lebay*. kok ngga update lagi mba???? belum up date ya, kawan?